Doha, Qatar – February 5, 2018 --- A delegation of senior administrators, including Northwestern University Provost Jonathan Holloway, visited the University’s campus in Qatar. During the visit Provost Holloway held a Town Hall with the NU-Q community. “Provost Holloway is a strong advocate for NU-Q and this visit provides an opportunity for the NU-Q community to hear directly from the University’s chief academic officer, as well as for the University’s senior academic administrators to observe the progress of NU-Q,” said Everette E. Dennis, dean and CEO. The delegation accompanying the provost included Lindsay Chase-Lansdale, vice provost for academics; Jake Julia, vice provost for administration and chief of staff; Ron Braeutigam, associate provost for undergraduate education; Jabbar Bennett, associate provost and chief diversity officer; Andrea Bueschel, associate provost for strategy and policy; Dwight Hamilton, associate vice president for equity and Title IX coordinator; and Lee West director of undergraduate education. Speaking at the Town Hall, Holloway, who joined Northwestern from Yale University last August, explained Northwestern’s plans to enhance the student life experience, online education, define a global agenda, and reaffirm his team’s role in providing Northwestern’s students and faculty with the support they needed to excel. During their two-day visit to NU-Q, the provost and his delegation met with faculty and students to discuss academia, research, and student life. The purpose of these discussions is to build on the collaboration between the campuses and to ensure NU-Q’s plans are aligned with Northwestern’s objectives and global agenda. 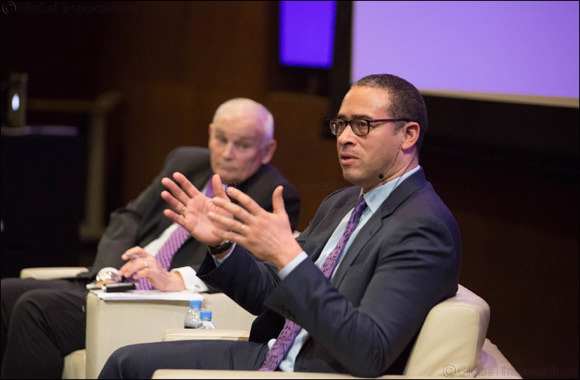 Holloway, who serves as the co-chair of NU-Q’s Joint Advisory Board, is responsible for overseeing educational policies and academic priorities at Northwestern. Prior to joining NU-Q, Holloway served as the dean of Yale College and was the Edmund S. Morgan Professor of African American Studies, History, and American Studies. Holloway began his academic career at the University of California, San Diego, before joining the faculty at Yale in 1999 and becoming a full professor in 2004.